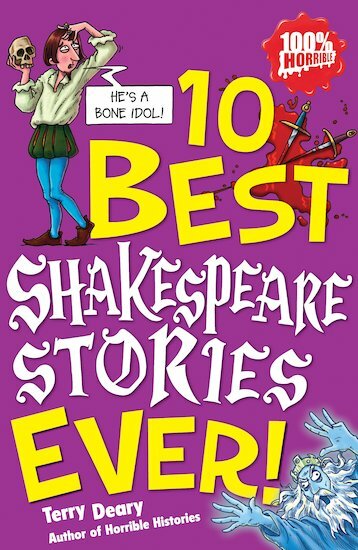 10 Best Ever: 10 Best Shakespeare Stories Ever! Shakespeare. Yawn! Weddings. Fairies. Kings. Queens. Boring bits. Blah… blah… Wait! SHOCKER! Here’s Shakey with the nasty bits! And goodness gracious me, how jolly nasty they are! ... plus photo-stories, weird witchcraft, crazy quizzes and cruel cartoons. Retold by star author Terry Deary, a man who knows just how to make you quake, this book brings you all of Shakey’s most shocking and bloodthirsty stories. It’s 100% horrible! all history books are cool. There are only two words to describe this book: Informative and Hilarious. It’s just perfect. Fantastic book. I loved Shakespear even before this book came out but now the stories are even more real and exciting to me. A must read for all avid historical readers. Funny too!